At a Capitol Hill briefing March 5, those supporters advocated for permanent funding for the Payment in Lieu of Taxes (PILT) program and a long-term funding solution for the Secure Rural Schools (SRS) program, both of which compensate counties for federally managed land that cannot be taxed. In particular, they championed the Forest Management for Rural Stability Act, sponsored by Sens. Ron Wyden (D-Ore.) and Mike Crapo (R-Idaho), which would create an endowment to fully fund SRS, first passed in 2000 and which Wyden sponsored. 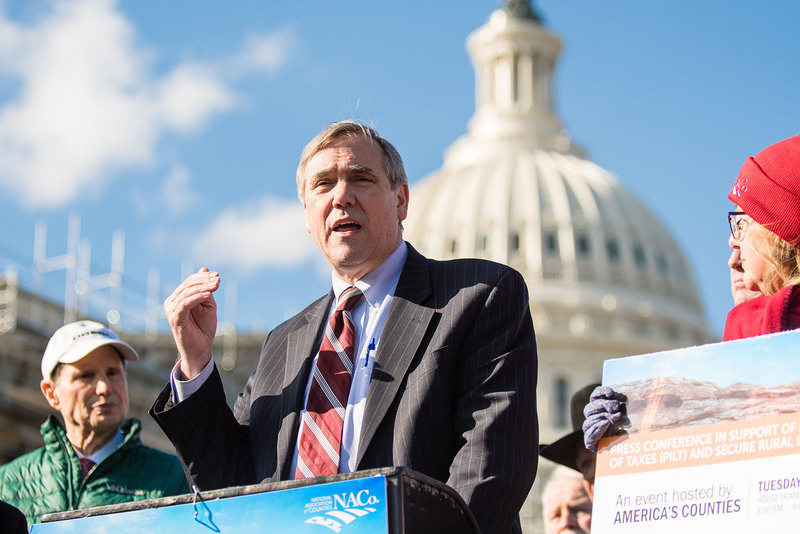 “We are as close now as we have ever been,” said Sen. Jeff Merkley (D-Ore.), who that day declined to run for president in favor of a Senate reelection race in 2020. Wyden pointed out that he, as ranking Democrat on the Senate Finance Committee, and Crapo, the senior Republican on the committee, seemed to have the clout to move the bill. “We just might be well positioned to finally get the revenue to secure the services that you had a right to have starting over 100 years ago,” he said. Rep. Cathy McMorris Rodgers (R-Wash.), chair of the House Republican Conference, framed PILT and SRS as leveling the playing field for rural counties. The 10 Eastern Washington counties in her district received $4.5 million in PILT funding in FY 2018. “Without PILT and SRS, many of the counties I represent would only struggle more to keep up,” she said. Harney County, Ore., which received $2.8 million in FY 2018, is larger than six states but three-quarters of its land is managed by the Bureau of Reclamation, Bureau of Land Management, U.S. Fish and Wildlife Service and U.S. Forest Service. “When SRS wasn’t reauthorized (for FY 2016), we were having conversations on what roads we were going to grind up,” said Commissioner Mark Owens. Rep. Salud Carbajal (D-Calif.), a former Santa Barbara County supervisor, didn’t like that proposition. “That uncertainty is not the way local governments want to budget to address safety-net issues like making sure our homeless veterans have services, that we have mental health programs, that we are serving our infrastructure and providing for public safety,” he said. The tradeoff seemed fair to Rep. Bruce Westerman (R-Ark.). “If we’re going to have federal lands, we should compensate the counties that provide emergency services, provide roads and other services that county residents depend on,” he said.